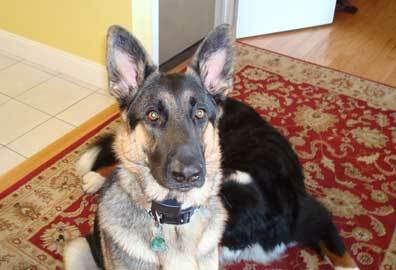 Thanks so much for sharing those great pictures of your German Shepherd and your Bernese Mountain Dog. I have seen a lot of things before, but never a German Shepherd with a Bernese Mountain Dog Chair. 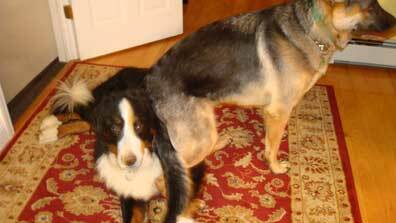 I have been the chair for several of my own German Shepherds in the past but have never seen any of my dogs sit on one of the others. (At least not on purpose) Too funny. And the expression on your GSDs face is hilarious. And the one on the Bernie is priceless too. Please keep the pics coming in - we all love to see them. And to see something unique like this - priceless. Thanks again Ursula - and continued success with your Bernie and your German Shepherd Dog. I'm sure they'll keep you entertained for years to come. Hi Ursula, Thank you for sharing those beautiful photos of Klaus! He is so handsome!